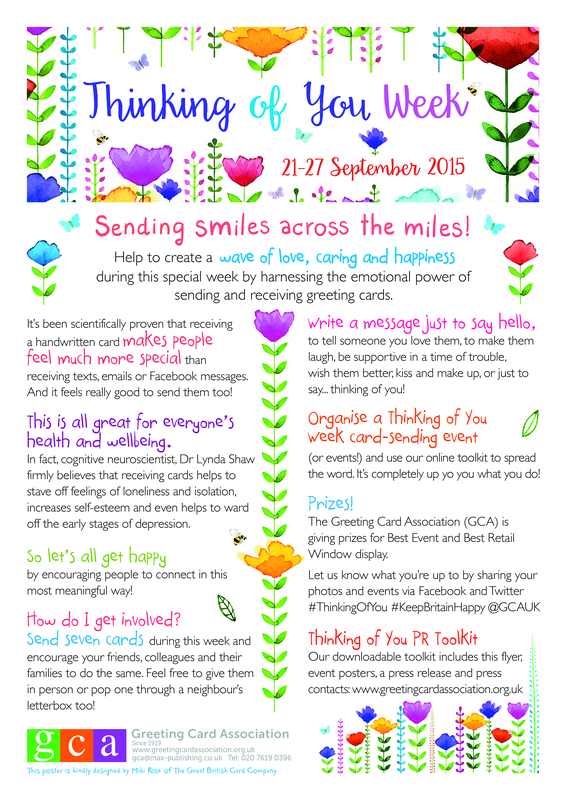 Here in the UK we have something lovely happening every year – National Thinking Of You Week. 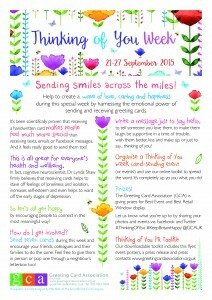 The Greeting Card Association (GCA) launched it last year and due to its tremendous success it is going to run as an annual campaign. The idea behind is to send a real card a day to someone you love, care, haven’t been in touch for a very long time or simply to say hello. The campaign aims to create a wave of love, caring and happiness during the week of September 21-27 2015. 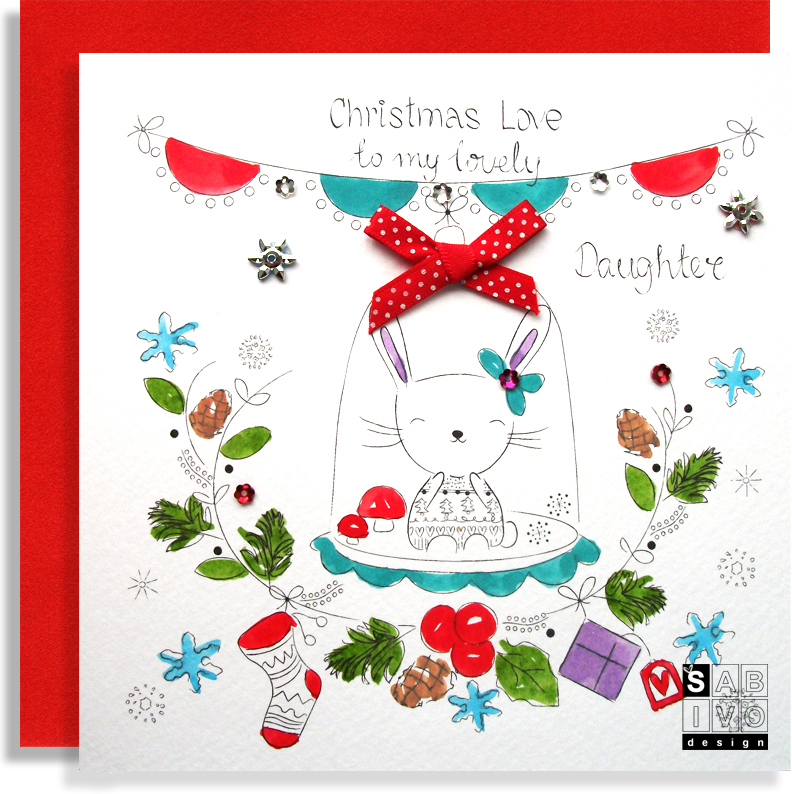 Unlike anything you send or receive via digital channels, a greeting card will bring joy and happiness to the person sending the card and to the recipient. The campaign is going to be supported by the GCA, several small and larger retailers (and their magazines) and also a top consumer magazine Crafts Beautiful (readership 100,000). If you are a retailer, we encourage you to participate as it will bring awareness to your customers, will stimulate your mind to come up with some lovely events in store, which will drive footfall and customer spending. As usual there is a prize each for Best Event and Best Window Display so do share your photos for a chance to win! You can download a free toolkit to support your campaign by clicking here and use flyers and banners both in store and on social media (or use the banner from this blog post by simply right clicking in the picture). To participate in the campaign via social media, please use #ThinkingOfYou #SendingSmiles. Hope you have a great time planning and participating in the campaign. We are going to repeat it this year and we promise you, it really is worth it. 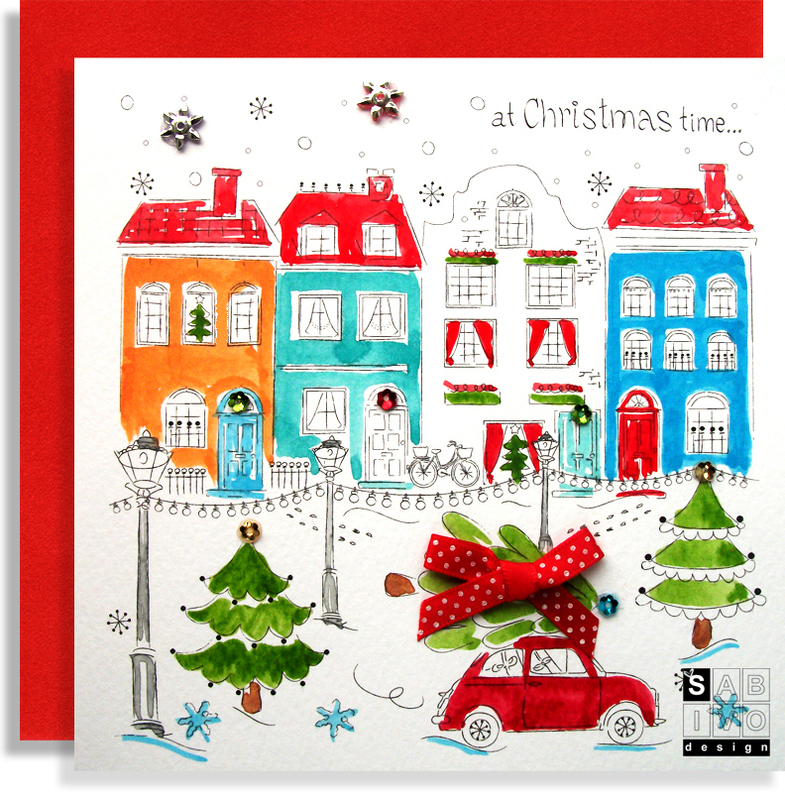 Have You Seen Our 2015 Christmas Range ‘Patterns’?! Our NEW Christmas range ‘Patterns’ has 24 designs to cover the most popular family relations and some open greetings designs. Our contemporary cards are designed, printed and hand-finished, right here in the UK and combine hand-lettering with quirky illustrations. We have combined traditional watercolour and gouache drawings with computer line drawing and incorporated some Nordic patterns across all designs to give you something really fresh and original. 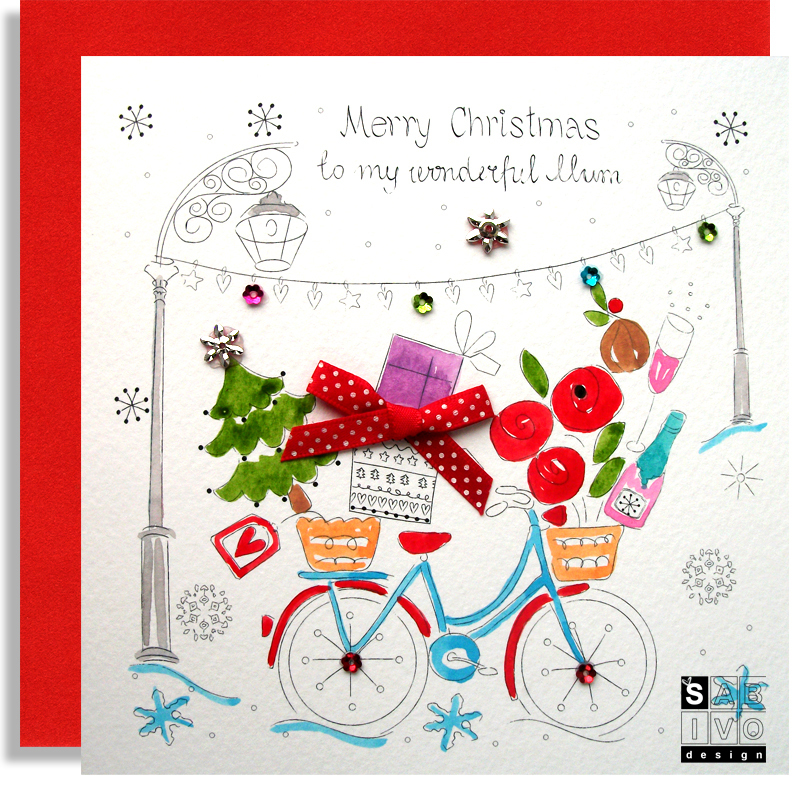 For extra festive sparkle, we have hand-finished our cards with polka dot cotton bows, silver snowflakes, cup flowers and 3D star jewels. The cards are 145 mm square, and wrapped in red envelopes. To view the full range please go to our trade section or click here. You can also view our 2014 Christmas range which was a huge success for us and we are delighted to be still manufacturing it. With ever increasing consumer demand for personal communication we are delighted to offer complimentary change of captions. As a retailer, all you have to do is let us know you preferred caption upon placing your order. Should you be member of the public, then please head to one of our social media pages, become our fan and all your personalised greeting cards will be done for FREE. There is no catch but you can check the details here. Hope you love our cards and they would help you make somebody’s day very special. 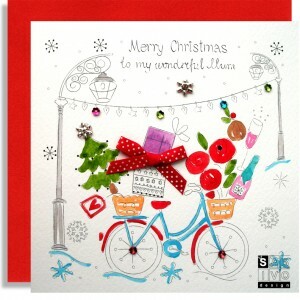 Write a greeting card, send a personal thought to the dearest this Christmas. This happy moment will last a lifetime. We guarantee.